Two captains who have been accused of being negative, boring, defensive, and uninspiring. Both captain in Tests and ODIs and don’t play T20s internationally. 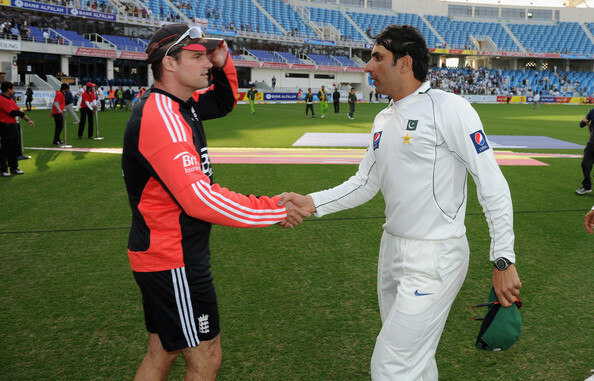 Both had a 9-1 Test record as captain in Test Cricket at one stage. Both have beaten nine different ODI sides in series or more. Both can be traditional batsman in approach. Both have been leading their sides in ODIs since May 2011. Alastair Cook has publicly hit back at Shane Warne’s comments after continuous attacks, saying the attacks are personal rather than constructive. Warne has criticised Cook a lot, but nowhere near to the level Mohammad Yousuf has targeted Misbah unnecessarily. This is what Misbah needs to do to Yousuf. He should have done it a long time ago. Sometimes not standing up for yourself is a sign of weakness, when the grudges become alarmingly obvious, something needs to be done and Yousuf needs to know he can’t get away with such distasteful comments. Now, Shane Warne is arguably the greatest spinner ever. 708 test wickets tell you all you need to know. Mohammad Yousuf is not up to Shane Warne’s level, nowhere near as a player. He is not in the ICC Hall of Fame. He would struggle to get into an all-time Pakistan XI. If Cook can hit back at Shane Warne. Then Misbah shouldn’t worry about hitting back at Mohammad Yousuf. Every successful captain has a right to unleash his anger at unwarranted criticism, at least once during his captaincy. Misbah hasn’t taken his chance in this.